It really is the perfect way to add just one little thing about your everyday life into each and every day. 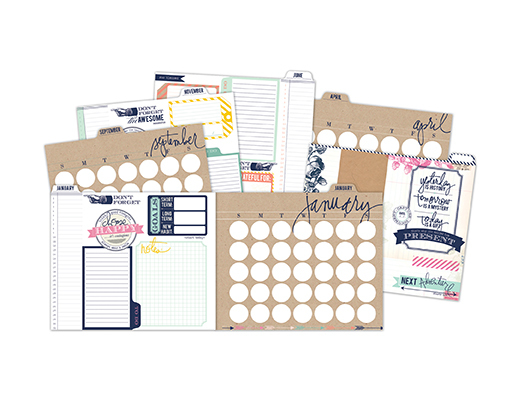 Some people use their Memory Planners as straight-out planners...keeping track of appointments, menus, schedules, whatever. Some people use it as a smaller version of Project Life...some use it as a scrapbook - adding photos and embellishments from each month. For example, in January I added one inspirational quote or thought to each day...in March I added things I was lucky for...in May I used a set of journal prompts to write something new each day...and for this month, June, I'm doing something just a little different. This month I'm keeping track of one thing each day that makes me happy. And not only am I writing down the things that are making me happy...I'm also photographing those things and adding the photos to my planner. 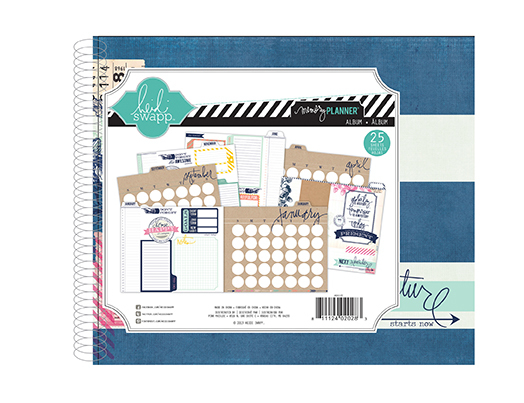 How, you ask, am I doing this when the planner has a space just a little over an inch in diameter allotted to each day? There are 2 way of doing this that I'm going to talk about today. The first one uses Photoshop Elements and is a little more specific and customizable. The second can be used with any photo editing program. For both ways you will need a 1" circle punch. Each of the little 1" turquoise circles is a layer added to a 6"x4" background. You can see each layer under your "layers panel" on the right side of your screen. Into each of these circles is where we're going to add your photos. 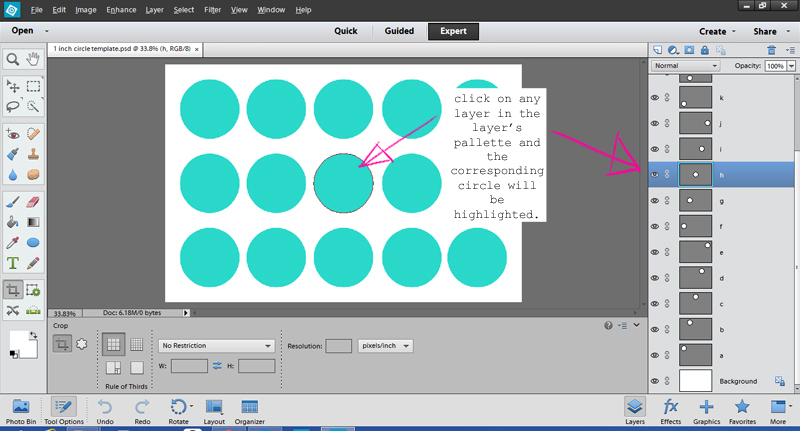 Just in case you are unfamiliar with working in layers in PSE, you can see that when you click on one of the circles in the template, the corresponding layer will be highlighted...and vice versa. 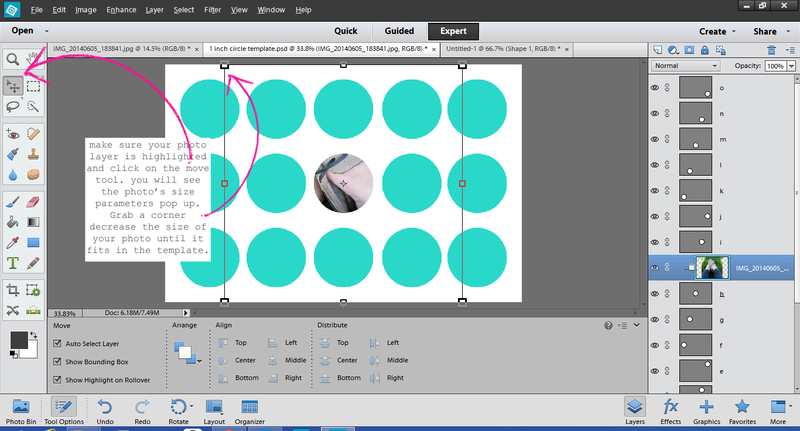 Click on a layer, and the circle will be highlighted. For my example I am adding my photo to the middle circle. While your template is showing on your screen, single left click (and hold!) on your photo (while it's in the bin) and physically move it so that it's on top of your template. This (or something similar) is what you should see. You will see that your photo layer is now sitting on top of the circle layer. Now here's where it gets just a little tricky...but don't worry - once you do it one time you'll be a pro. 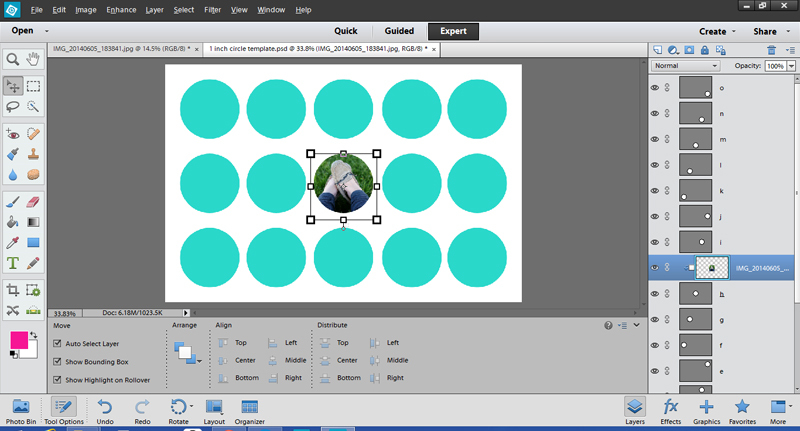 Place your cursor DIRECTLY on the horizontal line separating your photo and circle layers. Now, press (and hold!) the "Alt" key. You should see a little symbol come up that looks like a white circle joined with a little black circle. There will also be a little black arrow pointing left right next to the joined circles. NOW...while you are seeing that symbol, left click ONCE. 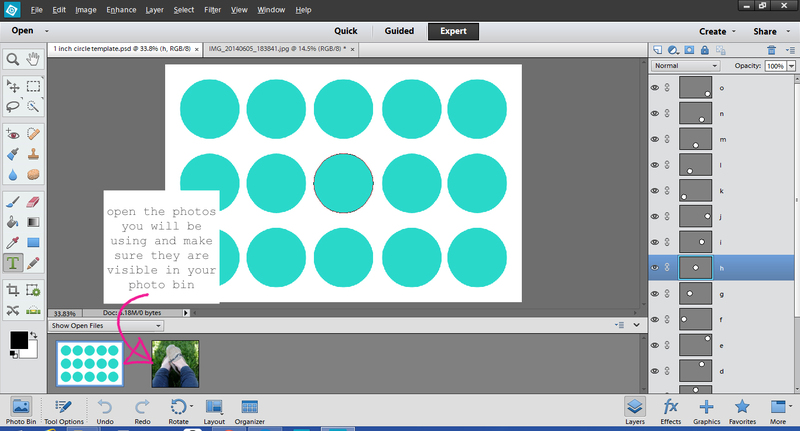 You will notice that your photo has now taken the shape (in this case, a 1" circle) of your template! woo hoo! This is called "clipping." Click on your photo layer to highlight it. Then click on your move tool. You should see your original photo's size parameters appear on your screen. This is how you will size your photo to fit into the circle. Grab one corner (when you have it grabbed correctly, you will see a little diagonal line appear) and pull your corner toward the center...your box should decrease in size. Keep decreasing the size of your photo until the way you like the way it looks in your circle. When you are all finished adding photos, you'll want to flatten your image. 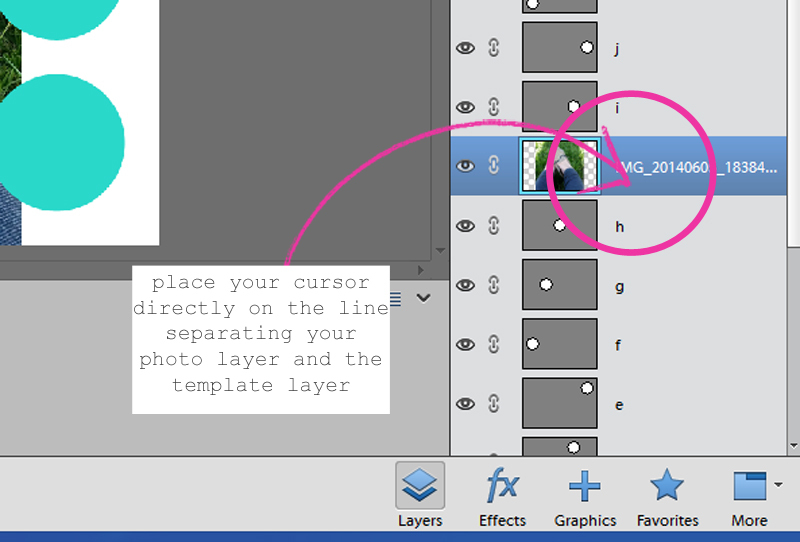 To do this, go to the "Layer" tab at the top of your screen and scroll down to "Flatten Image." All of your layers will fall down into one. If, at this point, you've realized you made a mistake or you want to add (or delete) photos, simply click "Ctrl Z" to undo your last action...or click "Edit" at the top of your screen and then click "Undo." Now that your image has been flattened you're ready to print! This image is already sized to 6"x4" and 300 dpi (good print quality) - so you shouldn't have to resize it. If you are using 4"x6" photo paper to print, simply change your printer's parameters paper size to 4"x6" and make sure you have the correct paper orientation (landscape) selected - you may want to preview your print image just to make sure it will be printing correctly. If you send your images out to be printed, just upload the image directly to your printer's site as is. 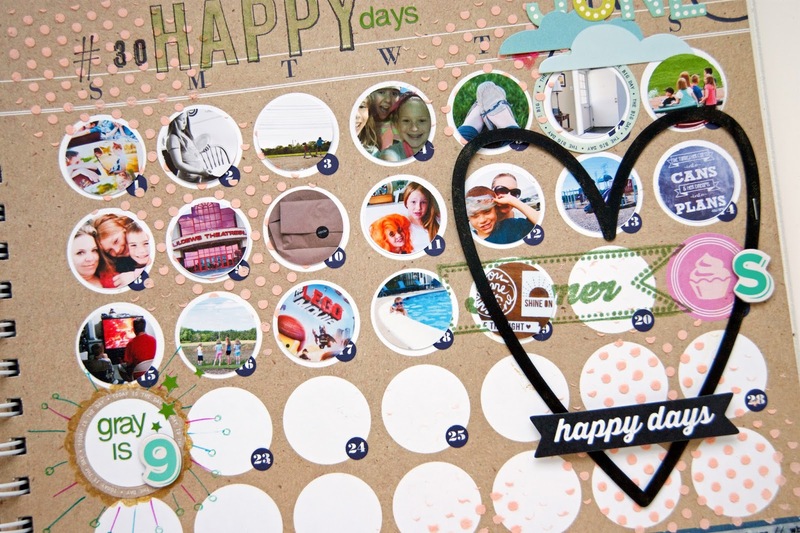 Once you have your template + photos printed, simply punch out each image with a 1" circle punch! NOW...if you don't use PSE, here is a way you can get almost the same effect with any photo-editing program. *Open your photo in your editing software. 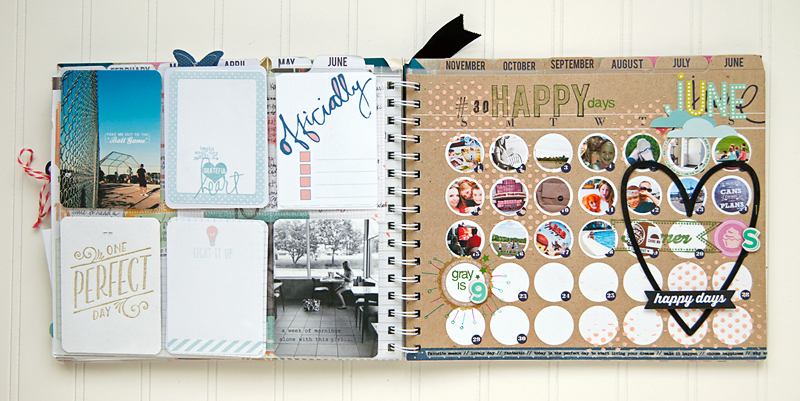 *Crop your photo so that the area of your image you want for your planner is as big as possible. *Resize your cropped image to about 1.5" x 1.5" and 300 dpi. 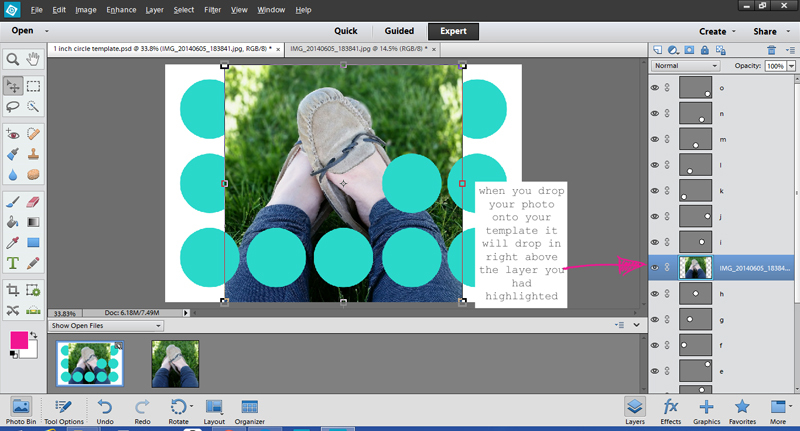 *Print out your photo and use a 1" circle punch to cut out your image. *Note that this way of making your 1" photos isn't quite as precise as using the template...you'll have to do a little guessing and/or cropping of your photo to get just the parts of your image that you want to document. It's not impossible by any means...it's just a little more guesswork. I hope this little tutorial has helped you see just how I've gotten my photos to fit into my planner...and I hope you give it a try! If you do decide to add photos to your planner and you use this technique, I'd love to see what you do! Tag me @maggie_massey_ on Instagram and let me see your work! If you have any trouble at all using this tutorial, please contact me at maggie@midwesterngirldiy.com and I'd be more than happy to help you in any way I can. Hi Maggie, thanks for the template, I have the planner but haven't decided how I am going to use it yet. 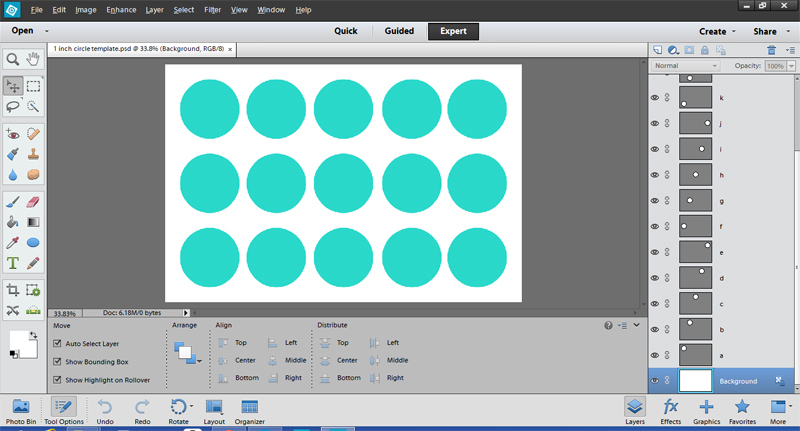 I downloaded the template and opened it with PSE12, like you explain, but when I try to click on one of the dots, I get a message stating something to the effect about this needs to be simplified and it will no longer have a vector layer? I am not able to click on each dot to pull in my photos. I also get the photos as my background layer when I open them and not my template. Can you help me? Can you tell I am new to PSE??? Thanks! Yes! Sophie! I think I can help! But I can't email you bc I don't have ur email address! If you see this, pls. contact me at maggie@midwesterngirldiy.com and i will be in touch right away...thank you!!! Maggie, this was great. Thank you so much. Love it!